New research suggests that short brand stories, displayed on product packages, can increase product sales. There was a time when a brand’s promise of quality and reliability were enough to earn the trust and loyalty of consumers. Not anymore. Today, brands must go further to connect with consumers. They must convince consumers that their product is worth the money and that it is better than alternatives, but also that it has been ethically sourced or managed, is sustainable, and that the business operates in a socially responsible way. In other words, brands must sell consumers on their business model as much as their business. And, new research suggests that one way to accomplish this is by showcasing short brand stories on product packages. But what makes for an effective short brand story? Researchers at the Hanken School of Economics in Finland designed a series of experiments to test the effectiveness of short brand stories displayed on product packaging. In one experiment, they compared perceptions of a liquid laundry detergent that either contained a short brand story (98 words) on the package or did not. They found that respondents who evaluated the package with the short brand story rated the product higher on perceived value, purchase intent, and word-of-mouth intentions than those who evaluated the same product but without the short brand story. A follow-up study replicated the finding above with a few important differences. First, the researchers changed the evaluation domain from liquid laundry detergent to muesli — showing that the effect is replicable across different consumer categories. Second, instead of comparing products with or without brand stories, they changed the experimental design to compare muesli packages with either a short brand story or a bulleted list of benefits/differentiators. Again, they showed that evaluations of the muesli were more favorable when the benefits/differentiators were written in story form instead of displayed as a bulleted list. It is not hard to see that this research holds actionable insights for client-side marketers and insights professionals. For one, it suggests that if your organization doesn’t already have a brand story on its packaging, it might be time to include one. This can deepen the connection consumers have with your brand…and stronger brand connections translate into higher sales. But it is not enough to have any old brand story on your company’s packaging, it has to be the right story. The story must resonate with consumers, instilling trust that both the brand and the product are, in some sense, serving the greater good. The story must be memorable and positive, and it must be something that makes consumers want to tell their friends and family about. So how should you go about creating or optimizing your brand’s short story? The answer is simple: experiment, experiment, experiment. 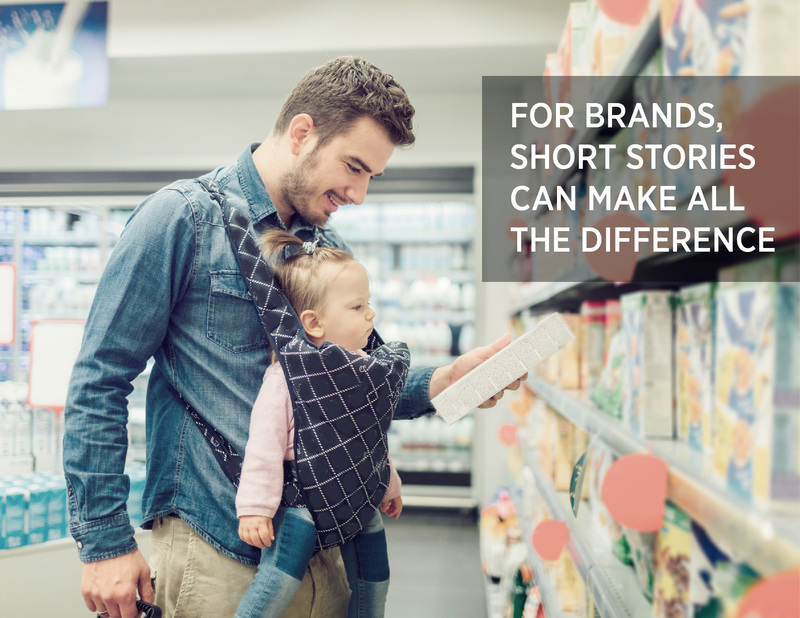 Compared to other marketing communications, short brand stories are limited by the size of the packaging, and they compete with information that is typically required by law to appear on packaging. Due to such constraints, and the overall importance of getting the story right, you’ll want to adopt a methodologically rigorous approach to brand story testing. You’ll want to make sure that the story is written in a way that connects with consumers. Various drafts of the story should be tested to see which resonates most strongly with consumers. You’ll then want to ensure that the story is placed on the right area of the package and that it is displayed in a way that captures consumers’ gaze. Eye-tracking research can be important here. And, in certain cases, you may even want to create slightly different brand stories that appeal to different consumer segments (depending on the product line it will appear on). Consumer testing can help optimize all facets of the short brand story — ensuring that your story connects with consumers and that your product is optimally differentiated from the crowd. For more information on crafting the perfect brand story, contact Thania Farrar.